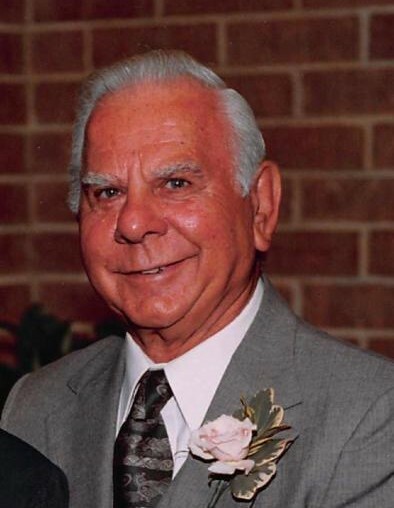 Obituary for Stephen J. Sugajski | Ajak Funeral Homes, Inc.
Of Natrona, passed away peacefully at home with family at his side Tuesday, Jan. 15, 2019. Born July 5, 1924, in Natrona, he was the son of the late John and Mary (Krwawnik) Sugajski. He was a lifelong resident of Natrona. Steve worked as a brick layer at Allegheny Ludlum Steel, Brackenridge and retired in 1986. He proudly served in the Army under General Patton as a radioman during World War II in the Normandy, Northern France, Rhineland, Ardennes and Central Europe battles. Steve was awarded several medals, including the American Theatre Service Medal, European African Middle Eastern Service Medal with five bronze stars and the Good Conduct Medal. Steve was a former member of the American Legion Post 48 Natrona. He was a member of St. Joseph Parish, St. Ladislaus Roman Catholic Church, Natrona. Steve was a talented woodworker, enjoyed cheering on his favorite sports team, the Pittsburgh Steelers, and liked the casino same-day bus trips. He loved his family and spending time with his wife, children, grandchildren and great-grandchildren, who were the center of his life. Survivors include his beloved wife of 68 years, Theresa (Dutkiewicz) Sugajski; loving father of Doris (David) Swick, of Lower Burrell, Marian (Gregg) Stack, of Medford, N.J., Stephen (Shirley) Sugajski, of Sarver, and Carolyn (Michael) Sankovich, of Lower Burrell; cherished grandfather of David (Michelle) Swick Jr., Nicole (William) Coury, Kristen (Larry) Logan, Greg Stack, Tracy (Greg) McCoy, Karianne (Joe) Bzorek, Trisha Shank, Brian Sugajski, Victoria (Nathan) Bahls and Christopher (Kara) Sankovich; and 20 great-grandchildren. In addition to his parents, he was preceded in death by his six siblings, Sophie Sugajski, Irene Komorowski, Jane Virag, Joseph Sugajski, Edward Sugajski and Walter Sugajski. Family and friends will be received from 2 to 6 p.m. Sunday, Jan. 20, 2019, at the PAUL R. AJAK FUNERAL HOME, 2 Pine Street and River Avenue, Natrona, where parting prayers will begin at 9:30 a.m. Monday, Jan. 21, 2019. A Christian funeral Mass will follow at 10 a.m. Monday in St. Ladislaus Roman Catholic Church, 46 Spruce St., Natrona. Burial with full military honors will follow at Mt. Airy Cemetery, Natrona Heights.